Since March – the dollar’s rallied over 7%. And it’s caused the Emerging Markets to implode. But the bigger problem is what lies ahead. And that’s a global dollar shortage – which the mainstream continues to ignore. . .
I’ve touched on this a couple months back. 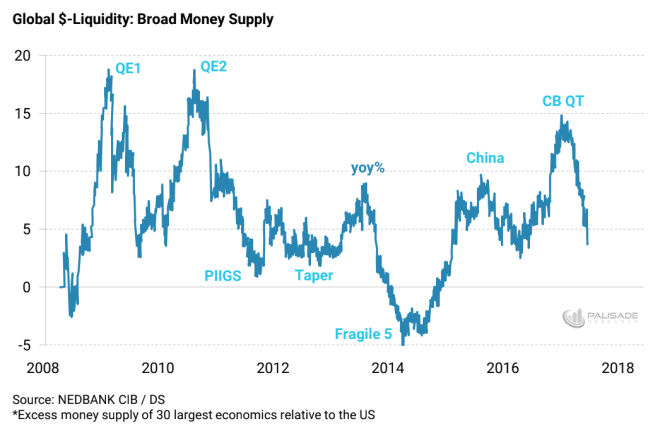 Wondering when the mainstream would start to realize that the stronger the dollar gets – the more pressure global economies will feel. Since then, things have only gotten worse. . .
First: Jerome Powell – the Fed Chairman – issued a statement at the end of June that they would actually increase the amount of rate hikes over the next two years. This means they’re tightening even faster. Second: the U.S. Treasury increased their debt-borrowing needs to the highest since the financial crisis – which was over a decade ago. Therefore, they will need even more dollars to fund their spending. And third: China’s growth is slowing down. Meanwhile the Emerging Markets are draining their U.S. dollar reserves even faster because of the strengthening dollar. 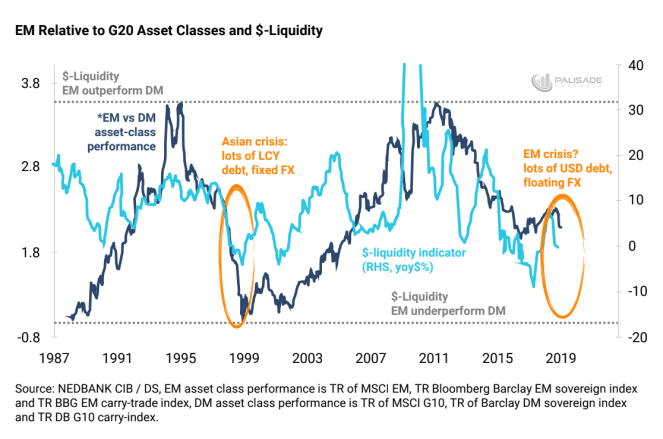 So, in summary: as global dollar liquidity continues drying up, there will be a wave of ‘risky’ positions being dumped and ‘dollar disease’ (selling assets to raise dollars to pay back debts) worldwide. . .
What we know is true from Economics-101 is that the lower the supply and the greater the demand equals a higher price. And as the pool of USD keeps drying up – then the price of the dollars must rise. This translates into higher offshore dollar funding (higher interest rates). Which is killing dollar indebted countries and corporations – like Turkey today. This is also why I expect a global earnings recession sometime by mid-2019. Bloated balance sheets worldwide can’t afford the deflation that comes with a shrinking dollar pool. Thanks to the Fed’s decade of ZIRP (zero interest rate policy), investors have been starved for yield. And this forced them into riskier trades. A popular trade that most Hedge Funds and investors utilize is called the ‘carry-trade’. . .
I’ll break it down: the ‘carry-trade’ is when someone borrows money with low-interest rates (like the U.S. or Japan for example). And converts the money into currencies with higher-interest rate bonds (such as Turkey). The trade makes money two ways – from the yields of the foreign bonds bought. And if the currency borrowed depreciates vs. the currency converted into appreciates. For example: if I borrowed $100,000 at 2% and converted it into Turkish Lira’s to buy two-year Turkish bonds yielding 8% – I would make 6% return. And hopefully in two years once the bonds mature, the dollar has weakened against the Lira by 10%. Then once I convert the $100,000 back – I make $10,000 just from the conversion alone. All was well as long as the dollar depreciates against currencies and the Fed kept interest rates low – which happened between 2008 – 2015. But today things are far different. . . In this current environment of tighter financial conditions and drying up liquidity – the Hedge Funds, Big Banks, and shadow banks with their ‘carry-trades’ are deep in the red. Hence why we’re seeing the Emerging Market credit bubble popping. As we learned from Ludwig Von Mises and the Austrian Business Cycle Theory (ABCT): when the Fed raises rates, the misallocation of credit is revealed and must be un-winded. . . I think future financial historians will scratch their heads wondering why markets today continued discounting this serious dollar-shortage problem. The easy money years post-2008 fueled a massive debt bubble – causing asset prices all over to rise. But the market isn’t expecting the tight moneyyears today to cause asset prices to drop. It’s like they think that drinking alcohol today will make them feel good – but don’t believe they’ll be hungover tomorrow. I believe the U.S. dollar will continue rallying because of all that I mentioned above. As Hedge Funds, institutions, and investors continue unloading their Emerging Market positions – things will only get worse. The stronger dollar will cripple these ‘soft’ money countries. And they will drain their dollar reserves as they vigorously try to defend their currencies. For instance – the Vietnamese Central Bank has sold $2.5 billion of their dollar reserves in July just to “limit depreciation of the Vietnamese Dong.” And the Reserve Bank of India (RBI) continues to sell U.S. dollars – after selling $6.2 billion worth – to prevent the Indian Rupee from depreciating further. Here’s an expensive question: how much longer can they do this before running out of dollar reserves? True, most Emerging Market countries today don’t have a fixed dollar-peg anymore. But since 2008, they’ve loaded up on massive amounts of dollar denominated debts. And this puts them in the same negative situation as a currency peg would. Don’t be surprised if the next crisis kicks off in the Emerging Markets – like the 1998 Asian Contagion/EM crisis. 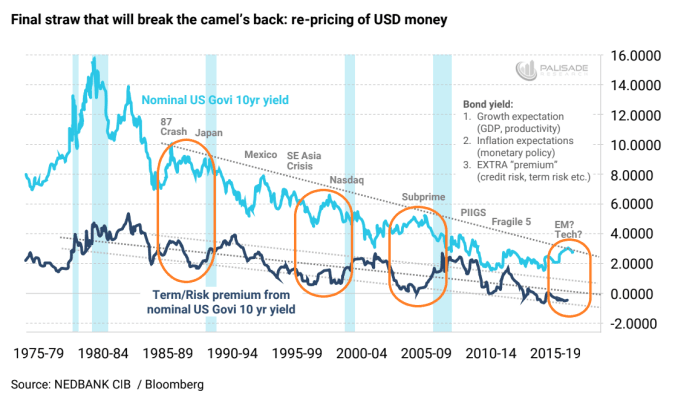 Countries with low ‘cover-ratios’ (small amounts of dollar reserves) will fall over first – then the contagion will spread across all Emerging Markets and most likely spill into developed markets. Don’t expect President Trump with his ‘America First’ agenda to show pity on these countries either. Until the U.S. starts to slow down – and only the U.S. – anticipate the Fed will continue tightening. Which will further shrink the pool of dollars – drying up global liquidity. Making the world’s markets much more fragile. Even if no one else talks about this problem – at least you heard it here. . . Author: Adem Tumerkan (PalisadeResearch)Before joining Palisade Global Investments, Adem was a Research Analyst at Stansberry Research – under Agora Financial. Adem is a born contrarian and has extensive knowledge of markets, financial history, and economics. He is a value investor and fascinated with cycle theory. But his focus on ‘black swans’ and how to position oneself to make huge returns during volatile times is what really separates him from the rest.